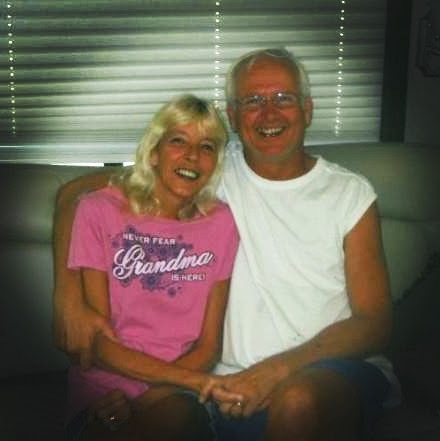 Many of our fellow RVing families know Doug and Karen Harmon (as they are about everyone's substitute grandparents down in Orlando!). If you were down there, they've probably fished with your kids. They're such a sweet couple who are always helping others, especially other fulltime families. Today we'll say goodbye to Karen at a campground memorial service, which will be the perfect way to celebrate her life. Karen was always hugging on us and serving God by serving others. We've known them since our first winter in Florida, years ago. We passed Doug somewhere in the campground and he and Matt greeted each other like old friends. I asked who he was and Matt said "Oh, he's the guy from the dumpster." The guy from the dumpster??? It turns out Doug had been helping Matt every time he took the trash to the dumpster. They were camped close to it and saw Matt struggling to get the bag up and over, so he helped. Then he started watching for Matt coming. Since then, we've gotten to know them and have seen them in Ohio and Indiana too. There's been fishing, duck bowling, shared meals, lots of candy, and we've even met most of their family since they're often surrounded by kids or grandkids.